This week’s class fell on Ganesha Puja so we opened with chanting the Ganesha mantra Vakratunda Mahakaya. Since the sound quality on the class recording is not great, I thought I’d give visitors to this blog a special treat. As many of you know, Daniel and I have been in the recording studio working on an album of mantras and chants. This is a preview clip from our version of Vakratunda Mahakaya, which will be the first track on the CD. Btw, please stay tuned for updates on the production of this amazing album. It’s been ten years in the making and well worth the wait. I’m hoping for a December 1 release. This chant is sung to the form of Ganesha called Vakratunda, who is personified as having five elephant heads with five twisted trunks. 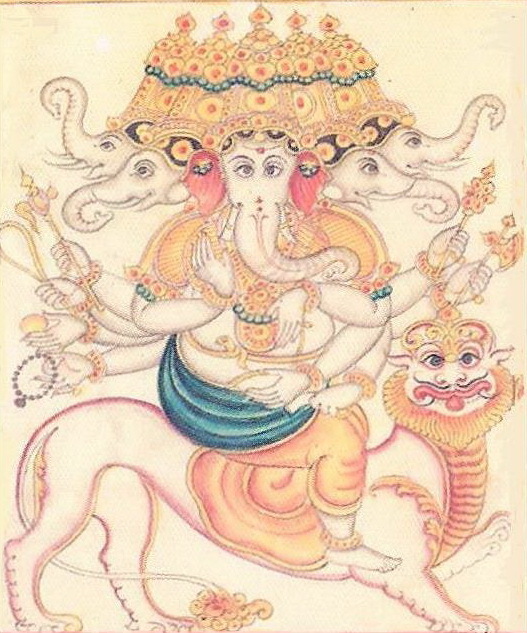 The twisted trunks can be understood as metaphors of the spiraling energy of kundalini; also Ganesha is associated with blessing new beginnings, removing obstacles, and guarding the sanctuary of the inner being. So as Vakratunda with five heads, these powers are quintupled! Yoga offers a profound system for transformation of body.mind.spirit. In a way though we can reduce the whole thing down to this simple notion: how to untwist from the twists that yank us out of alignment by twisting back into the spiraling luminosity of the Self. Here’s this week’s dharma talk, playing on this idea of twisting and untwisting… It runs just over 7 minutes. Here’s a simple dharana, chanting of Om Namah Shivaya, and a few more words before silent meditation.